Welcome to Critic's Notebook, a quick and off-the-cuff car review consisting of impressions, jottings, and marginalia regarding whatever The Drive writers happen to be driving. Today's edition: the 2018 BMW 640i xDrive Gran Turismo. I admit I am, at times, out of step with the auto industry. Like, if anyone had told me back in 2008 the BMW X6 would live on for a decade, I’d have shaken up the bottle of Crystal Pepsi I’ve been saving for 25 years and sprayed them with it. And though I’ve never admitted it before and I’ll deny it if anyone asks, back in 2000, I thought the Pontiac Aztek was a good idea. (It’s a car that’s also a tent. Huh.) And today, looking at the BMW 640i xDrive Gran Turismo with fresh eyes, I’m humbled enough to give this vexing model the benefit of the doubt, even if it seems a bit like a solution looking for a problem. The one-year-old 6 Series Gran Turismo replaces the 5 Series GT, whose ponderous styling once drew fire from U.S. car journos and fan-forum commenters alike. (BMW shook off the criticism, as it had other markets on its mind; only 10 percent of 5er GT sales came to the U.S., while China accounted for the largest portion, at one-third.) This 6 Series upholds a product construct BMW once called, cryptically, the "Progressive Activity Sedan,” or PAS, which emerged in 2009 as a sort of low-ground-clearance crossover. The 6er GT is the width of a 7 Series (74.9 inches), sits between the 5 Series and 7 Series in length (200.9 inches), and has a spacious rear cabin and a hatchback, but retains slightly taller proportions than an average car. Tons of cargo space, even with the seats up. The seating position is 2.4 inches higher than that of a standard 5 Series, while cargo space ranges from 31 cubic feet with the rear seats in place to a generous 65 cubic feet when they’re folded down. No doubt, this is a flexible package for moving people and things comfortably to places that require neither fording through nor crawling over nature’s bounty. The 6 Series GT’s updated design is far more pleasing to the eye than the 5 Series GT was. It's longer, with bulk-reducing lines and character creases, and a lower roofline that deemphasizes its rearward mass. Nonetheless, function dictates form, so the most controversial proportions—the higher roof, the eye-mugging rear—are largely intact. No doubt, this is a big car, with a higher center of gravity than the 5 Series. 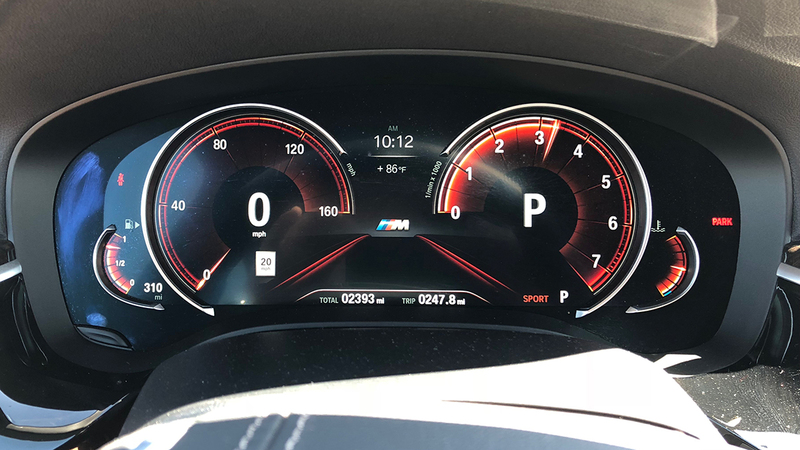 Yet, during a Sunday morning drive on the Angeles Crest and Angeles Forest highways—incidentally, to meet Matt Farah at Willow Springs raceway—I found the 640i shrinking into corners as if under the sway of some cosmic shoehorn. Stay under the limits of the tires and the nimbleness accrues as the curves tighten. Chalk up its chassis dynamics to all the latest tech included in BMW's $4,100 Dynamic Handling package, including continuously adaptive dampers, a two-axle air suspension, and actuated anti-roll bars, which also make the so-equipped 5 Series a well sorted beast. If only the controls better telegraphed what was happening down below, all would be right in the PAS world. The 640i xDrive Gran Turismo is definitely not your father's 6 Series. Like other luxury-minded BMW models, the 640i’s driving modes favor comfort, but they do extend to moderate sportiness. Selecting Sport firms up the dampers and clamps down on lateral load transfer with greater force, while doing so without introducing significant roughness to the ride. Comfort mode softens body movements and essentially erases high-frequency chatter. Selecting the Adaptive setting allows the system to switch automatically between Comfort and Sport based on driving style. 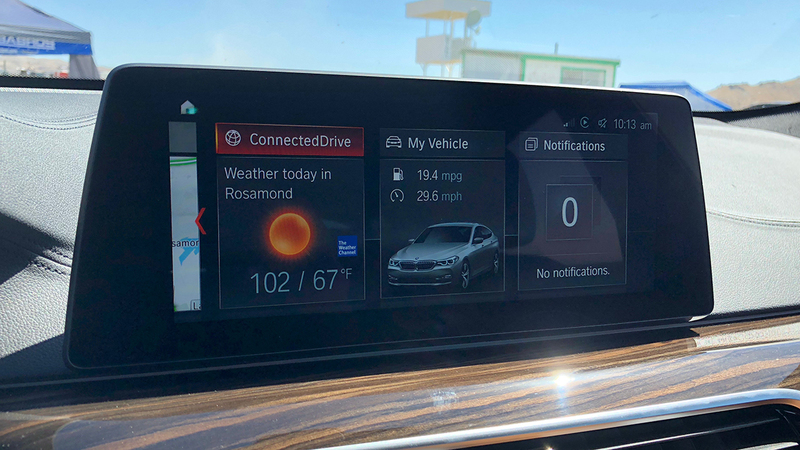 This sounds like a useless feature—until you set off on a road trip from El Segundo to Palmdale via the Angeles National Forest, combining several kinds of roadways of varying conditions, and arrive both energized and fatigue-free. 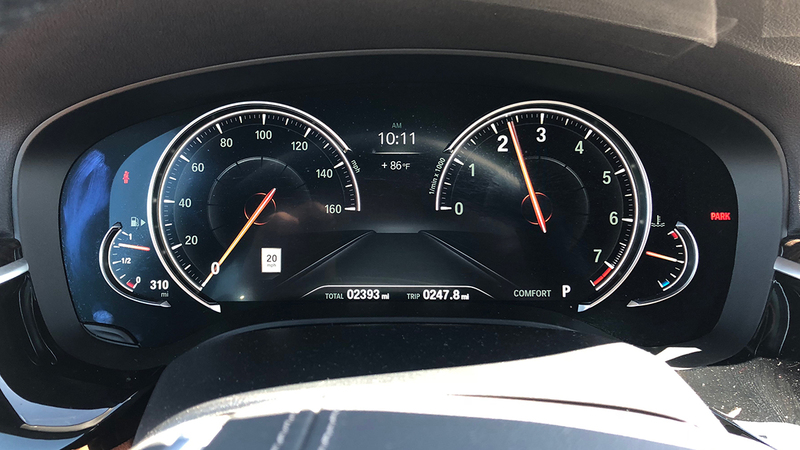 Speaking of adaptiveness, the latest generation of BMW’s adaptive steering tech—also included in the Dynamic Handling package—weights up more naturally than previous versions of the variable-ratio system did. The current calibration also forgoes simulated weightiness in favor of a lighter, more natural feel. BMW’s turbocharged inline-six's star just keeps rising in the luxury space. It feels plusher than ever and even more torquey than its 332 pound-feet would suggest, especially as it hauls this near-4,400-pound bruiser to 60 miles per hour in BMW’s claimed 5.1 seconds. Gas mileage is surprisingly good as well; even while wielding a heavy foot for a good portion of the trip, I still saw average efficiency in the low 20s (around 19 in the canyons). The smooth-shifting ZF eight-speed auto with crisp paddle-shift capability is nearly ubiquitous in luxury cars these days, and it’s well-suited to the task here. xDrive all-wheel-drive is unobtrusive, if not quite on spec for spring in L.A. Inside, BMW's created a breezy richness that feels both snug and spacious, owing as much to the gorgeous Dakota Cognac leather as to the standard panoramic moonroof. Rear passengers are pampered with loads of legroom and dainty little pillows that swaddle even the most bull-headed in cranial comfort. An elegant and airy interior for attending track days (as a spectator). 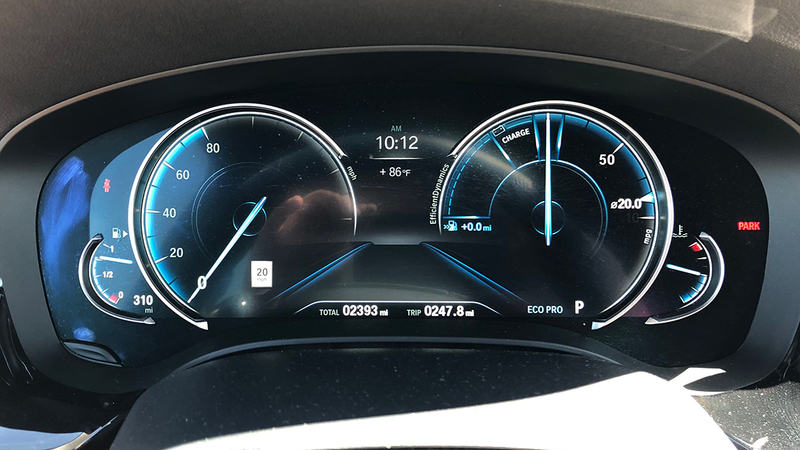 BMW has been coming on strong in the tech department for a long time; it was one of the first to implement an LCD instrument cluster that changes based on driving mode. But the excellence of its Apple CarPlay integration was a bit unexpected. 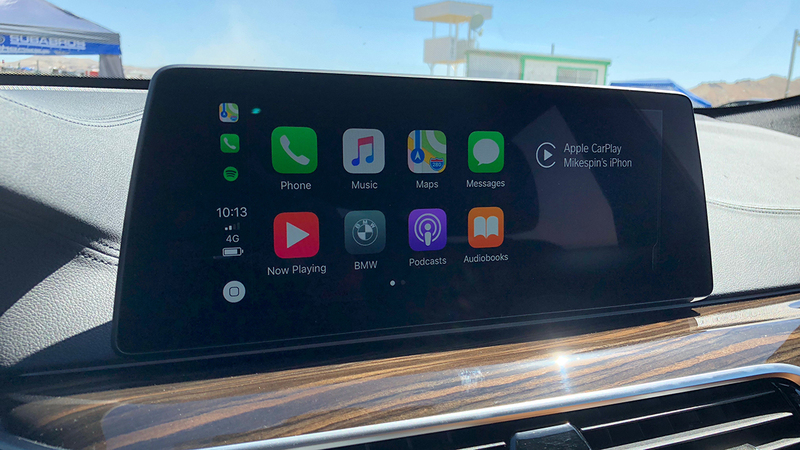 I'd heard talk about crashing and difficulty connecting, but over nearly a week, I had zero problems using CarPlay's functions. In fact, BMW's excellent touch screen setup makes snap-learning the system easy. 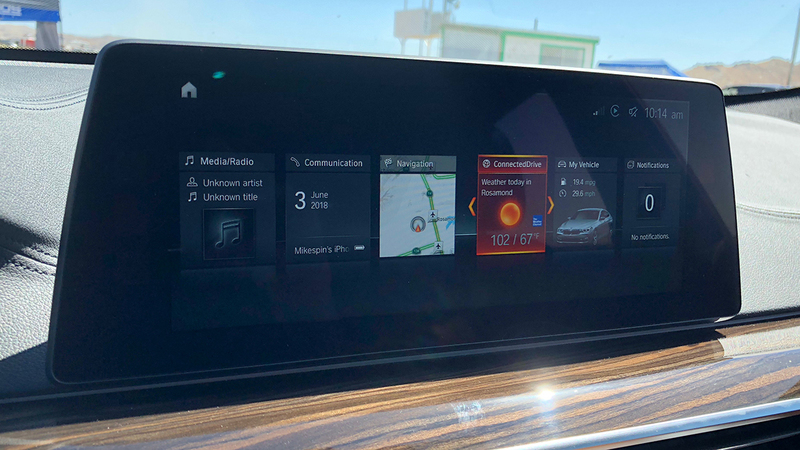 Perhaps reacting to the shellacking it once took from early versions of its iDrive, the company has since enabled every type of man-machine interface under the sun. I ended up just using the twist-dial controller or voice commands, rather than the more trick finger-writing and gesture-control options. Analysis of the deeper features of BMW's expanding infotainment scheme warrants its own article. One problem I have with the 640i, and it may be a matter of personal choice, is BMW's creeping move towards isolation-as-luxury. That is, the explicit value proposition of being cut off from the road, from the sound of the engine, from anything that’s going on outside the car. Word is, luxury buyers value isolation. And as for the product positioning? Considering sales of straight sedans, hatchbacks, and wagons have been dropping as SUV sales rise, maybe BMW is on to something by combining attributes of both. But hey, what do I know? I've been wrong before. If you're down with the Humpty Dumpty style, BMW's whatchamacalit—hatchback, crossover, demi-wagon—is one practical egg. The best-looking Gran Turismo-badged BMW ever, if that's your thing. Between aggressively low pricing and a generous tax break, the 530e is that rarest of things: A sweet deal on a new BMW. Downsizing and electrifying the powerplant of Bimmer's big sedan doesn't make it any less luxurious.